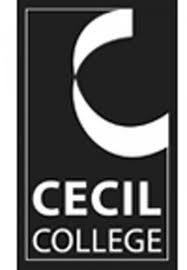 Cecil College is a comprehensive, open admission, learner-centered institution providing career, transfer and continuing education coursework and programs. Our more than 100 degree and certificate offerings anticipate and meet the dynamic intellectual, cultural and economic development challenges of Cecil County and the surrounding region. Through our support services and a technologically enriched learning environment, Cecil College strives to empower each learner with the skills, knowledge and values needed for college preparation, transfer to four-year colleges and universities, workforce entry or advancement, and personal enrichment.